Kuala Lumpur (VNA) – Vietnamese gymnast Le Thanh Tung bagged a gold medal for Vietnam on August 23 at the ongoing 29th Southeast Asian (SEA) Games in Malaysia. 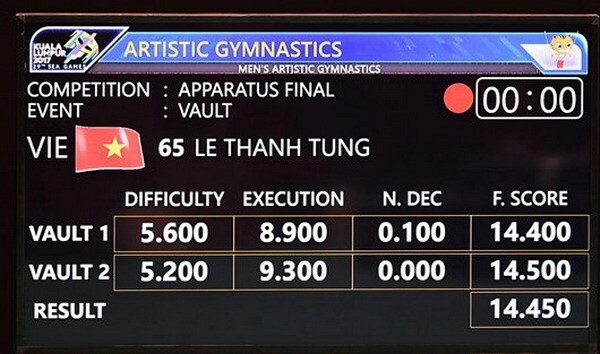 Tung, who is also a SEA Games defending champion, scored 14,500 points in the men’s vault. This is the first gold of Vietnam on the fourth official competition day of the 29th SEA Games and the country’s 17th gold medal so far. On August 22, gymnast Dang Nam has won the 9th gold medal for Vietnam after scoring 14,300 points in the rings event. The same day, Nam’s team mate Phuoc Hung secured a silver medal in the pommel horse event. Earlier, Vietnamese gymnastics athletes have obtained a gold medal for the team’s event with 319,050 points on August 20.